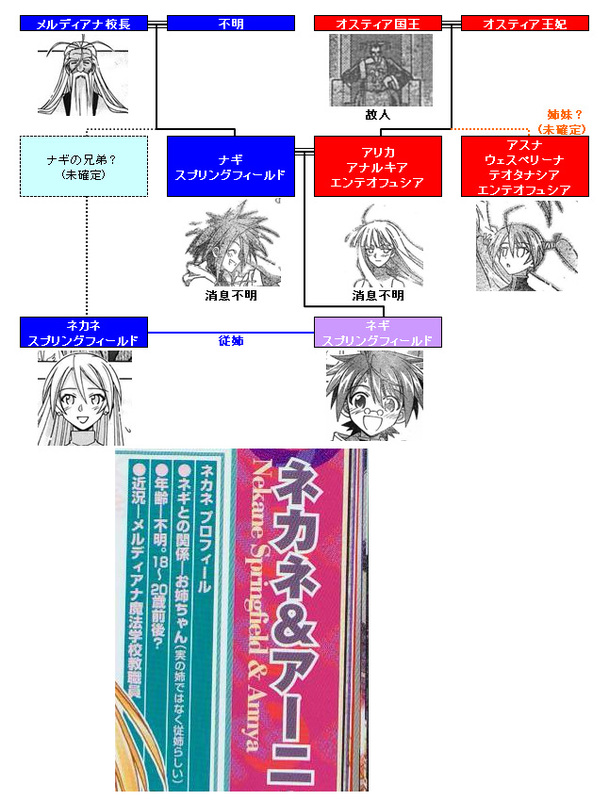 A Japanese fan posted this images on 2ch to show the speculated family charts of both Negi and Asuna. It is only speculation but it is interesting enough that I thought I’d share with you guys..
You forgot to list Negi’s Uncle that he lived with before his village was massacred. You do know that “AstroNerdBoy” didn’t actually create that, don’t you. As mentioned he found it on 2ch. So telling him that he missed about Negi’s uncle’s part would be worthless (unless you are saying it in general). As for the chart, it would really help if we could understand what it says. Have to wait for either “Zefyris” or “pedroami” or someone else to translate it. Hmmm… this means Asuna’s related to Negi if this chart is true… gross. That can’t be kosher. Maybe the can be some mistake on the side of negi, but the side of asuna can be wrong. Both arika and asuna are princess of ostia, and the name is similar, so they are sisters. There were a lot of hint in the manga, what let you know that they are blood related. In the past stories, they make clear that arika and asuna are related, and when it was made clear that arika is negi’s mother, then it made the bloodrelated connection between asuna and negi clear. The only mystery for me is still nekane, because she looks too similar to arika and asuna and i think it wasn’t just a coincidence. It should hold some meaning, and i hope nekane’s background will be cleared later. that states the relatives of negi, asuna (and other characters) but i question its credibility. if u look at the “known relatives” most characters have grandchildren or something. is this like a spin-off series from negima? That’s part of Project Arashi, which as I understand it, is a fan-fiction series written by a coalition of authors. I believe they have Love Hina and Negima characters in it.